Anyone can shop our event! No membership necessary. Check out our schedule below & grab your ticket! 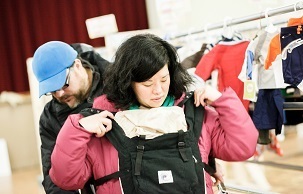 Come on in and shop from thousands of the best of gently used (and new) kids + maternity items. Everything inspected for condition and safety recall to ensure quality for you! Shop from baby to teen, Carter's to Bugaboo; toys, infant gear, books, games, shoes, furniture... so you, mom or dad, can stock up from a wide selection of fabulous items at a deep discount. Enjoy that feeling of victory (smart YOU!) as we pack up that amazing haul you just scored, for less! think green and bring your own. Early entrance to even deeper discounts! Clearance sale! Many items 90% OFF RETAIL!!! $2.50 online (tickets above) or $5 cash at the door. 2. Not valid for the First-Time Parent Presale. 3. Online ticket purchase: Pass will be sent via email after purchase. 4. Door admission: pass received at door. * For Consignors who check in at Dropoff. (or is expecting their first child!) INCLUDES Adoptive and Foster Parents that fit this description too - OF COURSE! The intersection of 240th street and Corlear Ave.
Street Level; stroller + expectant momma friendly. Take the 1 Train to either the 238th or 242nd street stops. Just off of the Major Deegan, Cross Bronx Expressways and Broadway. *After walking the area several times, we have seen plenty of open parking. We are deeply grateful to Holy Trinity in Inwood for their generosity. We have outgrown the space and management at Gaelic Park have been gracious as well! We are very thankful. "Being able to get rid of our old stuff, being able to make something back on it, and knowing that others will have the opportunity to fall in love with it, is what I like best about JBF." "I liked how organized and professional the event and the coordinators were. I also felt good selling my son’s clothes, books and toys because I knew that they would go to a good home as donations even if they didn’t sell. I think that this is a great franchise, and I hope that it continues to grow. However, it would be easier if it were closer to Queens where I live so that I wouldn’t have needed a friend to drive me out to the site." Want to join our marketplace and sell?